As expected, today Apple has revealed the iPhone 5 successor dubbed the iPhone 5S. Nearly identical to the iPhone 5, Apple's iPhone 5S sports an all-aluminum chamfered-edge construction with updated hardware as well as new features. Still boasting a 4-inch Retina display, the iPhone 5S will be offered in two new flavors besides silver - gold and gray. For security, the iPhone 5S features a new highly anticipated redesigned home button made of laser-cut sapphire crystal instead of plastic which acts as a lens for the embedded capacitive single-touch Touch ID fingerprint sensor that can read your finger at any orientation. With a stainless steel finger detection ring around it, the new Touch ID home button allows you to unlock your iPhone with a touch as well as authenticate an iTunes purchase without having to type in your password. Touch ID can read multiple fingerprints and doesn't upload the data to Apple's servers or anywhere online for that matter, but instead encrypts them and keeps them on your iPhone 5S. The iPhone 5S is X2 faster than its predecessor thanks to its new 64-bit A7 processor which is more than twice as fast than the A6 processor found in the iPhone 5 and iPhone 5C, and a boost in graphics performance up to X2 thanks in part to Open GL ES 3.0 support. Another new processor has been added called the M7 coprocessor which is designed to processes motion data more precisely. It can distinguish between you walking, running or driving. For example, Maps switches from driving to walking turn-by-turn navigation if, say, you park and continue on foot. Since M7 can tell when you’re in a moving vehicle, iPhone 5s won’t ask you to join Wi-Fi networks you pass by. And if your phone hasn’t moved for a while, like when you’re asleep, M7 reduces network pinging to spare your battery. As expected, Apple has also made improvements to the iPhone 5S' front-facing camera which boasts a 15% larger back-illuminated sensor compared to the iPhone 5, a new five-element f/2.2 lens (vs the iPhone 5's f/2.4 aperture), auto image stabilization and 8-megapixel resolution capable of shooting at a staggering 120fps with slow-motion video support at 720p HD video resolution alongside the normal 30fps at 1080p video recording with auto video stabilization. 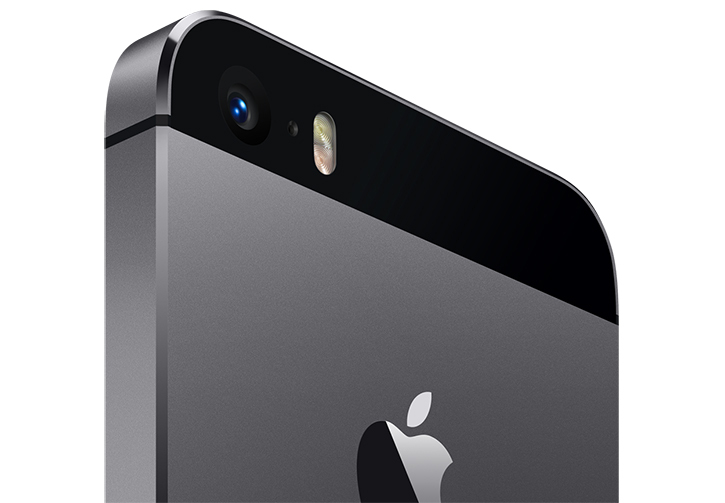 The iPhone 5S' camera is considered to be the best on the market. There's also a new True Tone dual-LED flash featuring two different LEDs. One is cool and white, the other is warm and amber in order to achieve the correct white balance so skin tones come out looking more natural. iOS 7 also enables you to capture a burst of 10 photos per second, while in the background software picks the sharpest results automatically. The iPhone 5S' battery life is good for up to 10 hours of 3G talk time, 4G LTE and WiFi internet browsing, up to 10 hours of video playback or 40 hours of music playback - and 250 hours on standby. You can purchase the iPhone 5S on a two-year contract for $199 (16GB), $299 (32GB) and $399 (64GB) when it's released on September 20. No pre-orders are available unfortunately. Off-contract unlocked prices start at $649.